Who Were the first Boycotters in 1933, the Nazis or the Jews? Kristallnacht, the Night of Broken Glass, happened 75 years ago when Nazi thugs conducted a wave of violent anti-Jewish pogroms on the streets of Berlin and other cities in Germany. The first article, Kristallnacht 75th Anniversary: What Really Happened in Nazi Germany?, agrees with Obama that Kristallnacht foreshadowed the Holocaust, but points out that the murder of Ernst vom Rath by Herschel Grynszpan, a teenager, who thought vom Rath was the German ambassador, foreshadowed Kristallnacht. The second article, Kristallnacht, Grynszpan and the Munich Agreement: Connect the World War Dots, documents that the Munich agreement foreshadowed Herschel Grynszpan and that the Versailles Treaty foreshadowed World War II. In other words 70 Million Died So The Jews Could Have Palestine. Prior to 1933, the Jewish people, who pursued a strategy of assimilation, had no interest in moving to Palestine and saw the Zionism movement as contributing to, not eliminating, anti-Semitism. Page 16 of Herzl’s diary confirms the Rothschild Zionist movement will contribute to anti-Semitism. In other words, a distinction must be made between an irrational movement in 1897 by a few wealthy Europeans, and a rational movement after 1933 by thousands of people who believed they needed their own state to escape persecution. Click here to visit a website devoted to documenting how the ideology of the Rothschild family exploited anti-Semitism for the last 50 years. Historians agree that 1933 marked the beginning of the attack on the Jews, leading to concentration camps and the holocaust. However, most of our filtered history textbooks overlook and often ignore that the German people have not always been anti-Semites. The United States Holocaust Memorial Museum’s website documents that up until 1933, German Jews enjoyed full equality in the Weimar Republic. When the Nazis came to power, the lives of German Jews changed drastically, when on April 1, 1933, the Nazis carried out the first nationwide, planned action against them: a boycott of Jewish businesses. The nationwide boycott was not very successful and lasted just a day, but it marked the beginning of a nationwide campaign by the Nazi party against the entire German Jewish population. 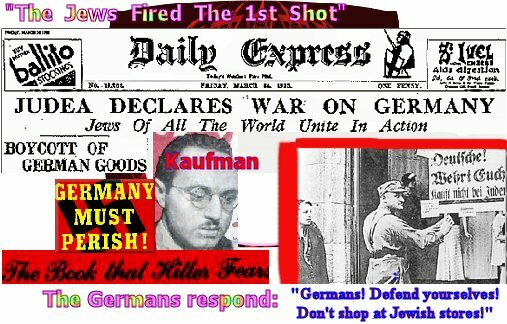 March 24, 1933, a few days before the German boycott that drastically changed the lives of German Jews, “The Jews Of All The World” declared war on Germany on the front page of the British newspaper Daily Express. The Germans, one of the friendliest country in the world towards the Jews, could very well feel their Jewish population had betrayed them. The German government gave the Jews refuge when they had to flee from Russia after the first attempted Communist coup failed in 1905. No wonder Storm Troopers painted yellow and black Hexagrams (aka known as the Megan David [Appendix B, also reproduced below – PB] and told their citizens to boycott Jewish-owned shops. Why would Wise and Untermeyer go out of their way to antagonize Hitler and the Germans by declaring War on Germany and initiating a boycott on Germany goods—which had about the same effect as a fly biting an elephant? Up to and during the 1916 Presidential campaign, the U.S. had no interest in a European adventure even after the suspicious sinking of “45,000 tons of live bait,” the Lusitania. No one was fooled by Wilson’s mysterious change in position, so a massive government propaganda campaign and the Espionage Act were required to sell the war. It was now a crime for Americans to speak against their government’s war effort, incite disloyalty, or encourage men to resist the draft. Wilson, the former “man of peace,” pleaded with Congress to declare war against Germany because when Wilson was president of Princeton he had an affair with a married woman, Mary Peck. Shortly after the inauguration, Samuel Untermeyer, attorney and generous contributor to Wilson’s presidential campaign, contacted Wilson about a breach of promise legal action from his client, Mary Peck. In late 1942, the Rothschild Zionists blocked a proposal from both houses of the British Parliament to evacuate 500,000 Jews from Europe, and resettle them in British colonies. Later the Jewish Agency delegation headed by Golda Meir (Meirson) ignored a German $250 offer to allow Jews to immigrate to other countries because Palestine was omitted. There is no order because Hitler used the term “Entfernung” – which translates to removal of the Jews — in this case entfernung of the Jews to Palestine. Up until 1933, not enough Jews had been “re” moved to Palestine. Kristallnacht, Grynszpan and the Munich Agreement: Connect the World War Dots Kristallnacht 75th Anniversary: What Really Happened in Nazi Germany? The influence of the con artist Cyrus Scofield and the Scofield Reference Bible, as the most important instrument for spreading the message of Christian Zionism: that the modern State of Israel is the fulfillment of biblical prophecy. The Beer Hall Putsch, The Munich Agreement and Zionist Collaboration with the Nazis are anomalies that can finally be reconciled. Part 3: Adolph Hitler: Providence, Miracle, or What Really Happened? Adolph Hitler, a gay prostitute and a street cleaner, who made every mistake possible in his failed attempt to take over the world, can finally be understood. On April 1, 1933, “on one of the best business days of the year, on the Saturday before Easter,” the regime declared a national boycott of Jewish businesses. In announcing this first national boycott, Hitler called it a “defensive measure” against anti-Nazi propaganda abroad for which he blamed the Jews. However most historians dismisses the entire incident because even a child understands that one-day economic boycott on Germany .. is going to have about the same effect as a fly biting an elephant. A boycott of German exports is not going make any kind of serious dent in an industry (munitions) that relies much more on internal resources, employment of German workers, and importing rather than exporting the materials needed for production. Maria Anna Schicklgruber, Adolf Hitler’s grandmother, “A little servant girl…….came to Vienna and became a domestic servant…….at the Rothschild mansion…….and Hitler’s unknown grandfather must be probably looked for in this magnificent house. Judaism: A religion based on the Torah and the Talmud practiced collectively by Jews. RothIsm or Rothschild Zionisn: abbreviation for The Zionist movement corrupted and co-opted by The House of Rothschild and their agents to make sure the Jewish people had their own state in 1948 to advance a New World Order agenda. Should the Dome be demolished, then for the first time in history, thanks to Saddam Hussein when he destroyed 90 percent of Iraq’s Wetlands, 200 million people could cross the Euphrates for a holy war in Jerusalem. In 1994, 60 percent of the wetlands were destroyed by Saddam Hussein’s regime. They were drained to permit military access and greater political control of the native Marsh Arabs. • A large-scale wave of anti-Jewish pogroms that swept Ukraine in 1881, after Jews were wrongly blamed for the assassination of Alexander II. Assimilation was legal in Europe after the Emancipation Edict of 1822 when Jews were guaranteed all civil rights. German Jews living in Germany, until 1933, enjoyed full equality in the Weimar Republic, many receiving high political positions like foreign minister and vice chancellor. In 1881, the Jews in the world who were aware of the events accepted the reality that anti-Semitism will never be completely eliminated. The history books confirm that Ashkenazi Jews continued [until 1933] with a strategy of assimilation. The religious Jews wouldn’t go because God told them not to. True Torah Jews, an organization dedicated to informing the world, and in particular the American public and politicians, that not all Jews support the ideology of the Zionist state called “Israel.” A political state formed before the Messiah returns is diametrically opposite to the teachings of traditional Judaism. The converted and assimilated Jews in European society had no interest or connection to the Holy Land. They were comfortable, religiously and materially, in their “Diaspora” communities. The majority of Jews living in Europe at the time enjoyed complete social, civil and legal rights. The outcry from the German Jews — the most assimilated of all of the Jews in Europe — forced the meeting to be moved to Basle, Switzerland. In the two thousand years of Divinely decreed exile, no “real” or converted Jew ever sought to end this exile and establish independent political sovereignty anywhere, until 1933. The Bauer family gained immense wealth and power and influence when they exploited the Battle of Waterloo. The House of Bauer after the battle attained complete financial control of Europe, and soon after, the world. The Bauers adopted the Red Hexagram/Red Shield, the six pointed star, as the family’s symbol and later changed their name to Rothschild, which translates in German to Redshield. The Hexagram was also used to represent Saturn, which has been identified as the esoteric name for, “Satan.” This indicates that anyone killed in the name of Israel is actually a sacrifice to Satan. The Rothschild, not the Jewish people, unilaterally decided the Jews needed their own state to escape persecution. The first meeting of the Zionist Congress was scheduled in Munich. Vociferous opposition for social, political and religious reasons came from every direction. The majority of Jews living in Europe at the time enjoyed complete social, civil and legal rights. The German Jews, the most assimilated of all of the Jews in Europe, forced the meeting to be moved to Basle, Switzerland. The meeting is held on August 29, 1897. Theodor Herzl, an agent of the Rothschilds, chairs the meeting and adopts the, ” Hexagram or Sign,” as the Zionist flag. Religious Jews believe that Zionism at the end of the 19th century is “the work of Satan, a sacrilege and a blasphemy. The Old Testament does not allow the Jewish people to establish their own state in the holy land until the messiah comes back (the Jews are still waiting for the messiah). In other words the reader needs to make the distinction between an irrational movement in 1897 by a few wealthy Khazars, The Rothschilds, and a rational movement after 1933 by thousands of people who believed they needed their own state to escape persecution. “it was estimated the House of Rothschild controlled almost half the wealth of the world.” National Cyclopaedia d American Biography by Antony Sutton. The World Order by Eustice Mullins, Staunton, VA: Ezra Pound Institute of Civilization, 1985, p.92.